For the past month or so I’ve been admiring a pink orchid-like weed that had seeded itself at the back of the allotment, by the stream (aka the Chad Brook). When I did that foraging evening with Loaf the other week I asked if they knew what it was and they did, it’s Himalayan Balsam. 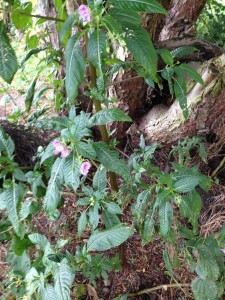 Since then I’ve heard about Himalayan Balsam all over the place. It is the weed du jour. No other weed has been so trendy. Apparently it explodes its seeds like little bombs, spreads mercilessly and tramps out everything in sight. Saint Bob of Flowerdew says to pull it up and chuck it on the compost. So I did. I also did the neighbours. And woah! This is some serious weed! 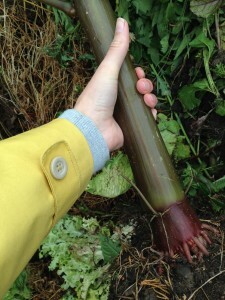 For something so fat – it reminded me of bamboo – this weed has no roots. To put another way, all fur coat and no trousers. I have new respect for the humble buttercup that is so discrete until bang! It’s everywhere and impossible to dig up. 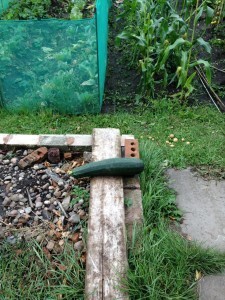 Marrow – forgotten or abandoned? We haven’t had a single marrow this year. This was the aim but there’s mixed feelings. On one hand smugness (queen of the courgette croppers!) but on the other we’ve missed out on that yearly saga of working out what the hell do I do with THIS? Know what I’ll be doing on 30 August. 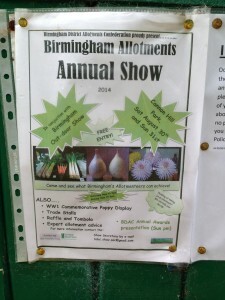 This entry was posted in Allotment, Summer and tagged Allotment show, Bob Flowerdew, Himalyan Balsam, Marrow, Weeds. Bookmark the permalink.